YouTube’s Hottest Make Up Tutorials for Halloween 2014! Slowly but surely it's getting colder and darker outside. The sun's setting early and autumn winds blow fiery red leaves through the streets. Halloween is right around the corner! Did you already decide on this year's costume or are you still looking for some creepy inspiration? We have roamed YouTube's world of makeup tutorials to bring you five looks that will make you an eye-catching goddess of horror! Of course everybody's afraid of discovering their first crinkle, but once a year you might even want to look old! 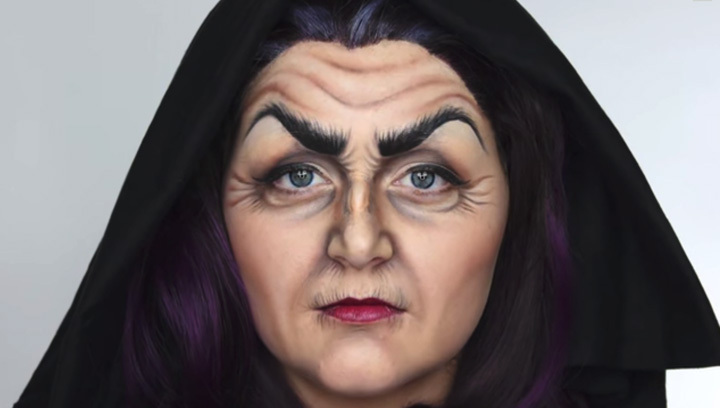 The vicious witch is one of the most classical Halloween characters of all times and with Shonagh Scott's makeup tutorial you can easily turn into a wrinkly hag for this year's creep show. Children most likely will scream at your sight after you topped off your outfit with a black hat and a broom. And don't forget to practice your witch's nasty giggle! Because it's nothing for the faint of heart, we strongly recommend to warn your friends beforehand, if you're going for this attention-hungry appearance. In her latest tutorial, YouTuber goldiestarling shows you how to use makeup and paper clay to create some huge fang-armed mouth and transform yourself into an all-devouring monster. Sadly there's one disadvantage to the look: While all your friends enjoy their Halloween candy or party snacks, your devouring will be reduced to sucking on a straw for the rest of the evening. But of course you could also go for something less scary and bring a little glamor to the spookiest night of the year. How about channeling your inner super hero (or super villain of course) and turning into leaf-covered vamp Poison Ivy with this makeup tutorial by Amanda Ensing? If you want to boost the originality of your costume, try using some makeup with autumn shades instead and involve actual twigs, leaves or other seasonal stuff. When it comes to Halloween, Little Red Riding Hood has been a favorite for decades, but this year Teni Panosian came up with a gorier interpretation of the popular look. While the main part of your makeup remains that of a stunning beauty, the blood-covered claw marks on your cheek make it a perfect choice for the night of big scares. And even if you don't have an actual Red Riding Hood costume, simply don a red blanket while your makeup is the center of attention. The video also links to a Big Bad Wolf tutorial, in case your boyfriend feels like joining! Here comes the godfather of Halloween costumes: The zombie. No October should end without the undead raising from their muddy graves to haunt us mortals. If you have a fancy for scaring the living hell out of your friends, give ellimacs' quite advanced tutorial a shot. It might require a lot of materials and even a helping hand, but people in the streets will flee in terror as you come chasing after them.